The Tirupati Tirumala Venkateswara Temple is the most visited place of worship in the world reports NDTV. The report compares Tirupati with Vatican. The average number of visitors in a year to Tirupati Balaji Temple is 19 million. According a report in New York Times, Vatican recorded just 4.2 million visitors in 2006. The Brahmotsavam which is beginning on September 15 is expected attract a million visitors to Tirupati. On a normal day Tirupati Balaji Temple receives 50,000 to 100,000 visitors and during weekends and public holidays it is more than 100,000. 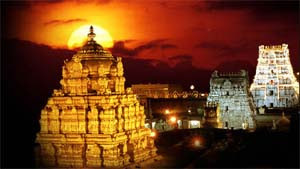 Tirupati is also one of the richest temples in the world with an estimated annual income of 7.5 billion rupees. Perhaps, Tirupati is the richest place of worship in the world. Each day, the hundi collection in Tirupati is breaking existing records. On September 10, the hundi collection was more than 20 million rupees. Another major source income to the temple is from the hair offered by devotees. The sale of human hair is expected to fetch 450 million to the temple.